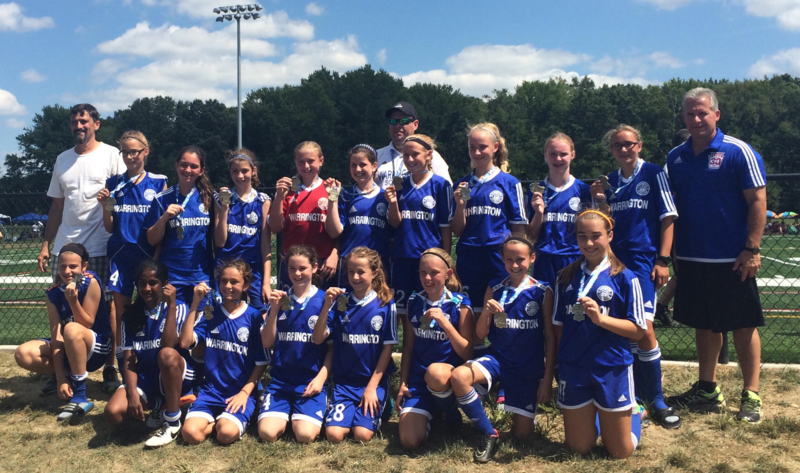 The Warrington Vipers Under 13 Girls team captured the championship at the 2016 Harrison SC Kickoff Classic in Mullica Hill, NJ. The team played in 90 plus degree temperatures with 3 games on traditional grass fields and the championship on a full size turf field. The team went 3-0-1 yielding only 3 Goals Against and generating 12 Goals with solid defensive work and a consistent high work rate from our attacking midfield and strikers. The final game was decided in a shootout with the Vipers converting 4 of 5 from the PK spot and yielding only 3 out of 5 with an excellent effort by the goal keeper with 2 huge saves. A great start as they head into the fall season. Well done girls and keep up the good work!